Ah, the last battle of the First Round is finally upon us. Barnabas vs. Elmo. 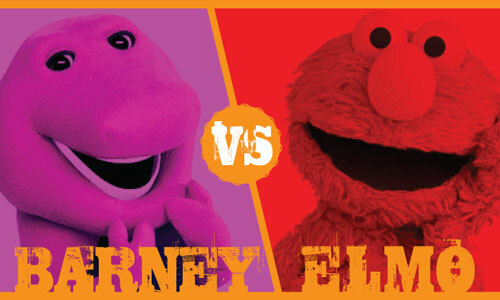 Or, as the Supreme Executive Committee, has dubbed it, Barney vs. Elmo. It’s a furry red and purple Lenten miracle! Yesterday, on the Lent Madness version of Super Tuesday, Frances Joseph-Gaudet left John Mason Neale singing the blues as she handily defeated him 68% to 32% to advance to the Saintly Sixteen, where she’ll face Sojourner Truth. All the voting excitement of Super Tuesday didn’t keep the Forward Movement staff from having a bit of fun, as you can see with our Barney vs. Elmo banner, fashioned by Michael Phillips in between designing book covers and websites. No word on whether he’s putting his skills to work on a Tim vs. Scott meme. Tomorrow the long-anticipated Round of the Saintly Sixteen begins. But first it’s time to vote and put the final nail in the first round coffin (don’t worry — we firmly believe in resurrection). Elmo, Bishop of Formium, was martyred in 303 in Italy. He is one of the Fourteen Holy Helpers. Also known as Erasmus, Elmo fled Formium during the Diocletian persecutions. Legend tells us an angel commanded Elmo to return and proclaim his faith. During his journey back to Formium, he encountered two soldiers who inquired about his faith. When he confessed he was a Christian, Elmo was promptly arrested and tortured. Depending upon the source material, Elmo was bound in iron chains, put into a pit filled with snakes and worms, sprayed with boiling oil, covered with sulfur and/or molten metal, thrown into a barrel studded with spikes and rolled off the top of a mountain, drawn and quartered by horses, and/or seated and baked in an oven. Miraculously, he survived this trial and was imprisoned but later freed by an angel. He journeyed to Lycia, where he preached and baptized 10,000. News of this vast conversion enraged Diocletian. Elmo was arrested, enduring more torture and humiliation. Ultimately, Elmo was martyred by being disemboweled. He is the patron saint of those suffering from intestinal maladies and sailors. Elmo is also associated with Saint Elmo’s fire, a weather phenomenon involving electrical excitement of the exotic matter state of plasma. This creates a coronal effect during thunderstorms that sailors associate with his protective presence. Almighty God, who labors with us through the waters of birth and all life’s voyages, we offer you thanks and praise for the life and ministry of Saint Elmo. Help us, in our own day, to proclaim the good news of Jesus with integrity and courage, no matter the consequence. Make us lights of your great love to those who are lost. Through Jesus Christ our Lord. Amen. Throughout Acts, Barnabas is a model of grace and compassion. In our first encounter with him, he is singled out among the believers as one who sold a field that belonged to him and laid the proceeds at the apostles’ feet. Barnabas is the first to welcome Saul/Paul to the community in Jerusalem. Although the other disciples shunned Saul/Paul out of fear that he had not really become a disciple, Barnabas vouched for him and allayed their fears. Perhaps nothing speaks to Barnabas’s graciousness so much as his ability to work with the notoriously prickly Apostle Paul. After welcoming Saul into the community in Jerusalem, Barnabas went to Antioch to lead the church there. He invited Saul (now known as Paul) to co-pastor the community. They worked together in Antioch for one year. According to Acts, Paul’s so-called “First Missionary Journey” was actually not Paul’s at all. Acts lists Barnabas first, as the one set apart for the journey. In one particularly telling episode, the residents of Lystra describe Barnabas as Zeus and Paul as Hermes. When they return to Jerusalem to report on their journeys, Barnabas is again listed first as they tell of “all the signs and wonders that God had done among the Gentiles” (Acts 15:12). 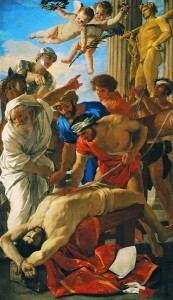 After this first journey together, Paul and Barnabas part ways on account of a “sharp” disagreement. Even the kindest of people have limits. According to tradition, Barnabas continued traveling and teaching, ultimately dying as a martyr in Salamis in 61 CE. Barnabas was taken prisoner in the night. A rope was tied around his neck, and he was dragged from the synagogue to the hippodrome where he was, depending on the source, either stoned or burned to death. 219 Comments to "Barnabas vs. Elmo"
Barnabas seems to have been a very kind man. We are all in sore need of kindness today. I vote for him. I voted for him to I read your comment and it turned me. What I thought was funny was that Elmo is the saint of those suffering from sailors. I voted Barnabas just he sold his field. I’m with you today Oliver. He did what Jesus said to do. Oliver, you might also enjoy the story (Jeremiah 32:1-13), in which the prophet Jeremiah buys a field during a siege. He does this because he has faith that God will bring the people of Israel back to their land after they are captured and taken away, even though it will be a long time before they return. Hey, Elaine! Good reminder . I agree with you, Oliver! That was a great thing that Barnabas did! Where do you live Oliver? I voted for Elmo because he has a meteorological phenomenon named for him. How cool is that? As a weather geek, I appreciate this as well! I’m a water girl – St. Elmo, patron saint of sailors, for me. Anyone with enough grace to work with a “notoriously prickly” Paul has to be a worthy winner of my vote. Thank you, Barnabas. Anyone that could put up with Paul is a saint in my book! C. I am a sailor. That was my reason, also. Barnaba it is. I was chaplain to St. Barnabas School in Philadelphia when I was curate in my first parish and I was ordained deacon on the feat of St. Barnabas. There is something about his name, “Son of Encouragement”, that speaks to me about the essential character of pastoral ministry, indeed of Christian witness, in a world that seeks to add as much discouragement as possible. I love your explanation for your vote. This was a tough one today ! Each faithful witnesses until the end. However, Barnabas was the face of love and compassion, and grace. That one always gets me in the end. “Grace and compassion” – I’ll take some of that! Are you a southpaw, Leon? My brain read that the same way, and since I have not suffered greatly from sailors, I chose Grace and Compassion today! Leon Spencer you made me burst out laughing – thanks for the clever comment. Hahaha! I hadn’t noticed that! I had that thought, too. The grammarian in me! I noticed that grammar, too, and got a good giggle. Glad you pointed it out for everybody. I’m an erstwhile sailor, but Barnabas has always been a favorite of mine, so this vote was easy. My former husband was a sailor. Nuff said. Seriously, Elmo’s story sounded like he ate some bad mushrooms on his travels. I served my first incumbency in a church dedicated to St Barnabas and have always admired him hugely. He was open, generous, kind and compassionate. He appears to have fallen out with Paul over their abandonment by the young man John Mark. Barnabas gave John Mark a second chance. It seems that Paul and John Mark were later reconciled. I like to think that Barnabas had a hand in that. How can I not vote for Barnabas, encourager and giver of second chances. Elmo baptizing 10,000 amd was arrested because of this. Ge gets my vote! Grace over fire. Onward Barnabas! Even though I would hate to suffer from sailors, esp. the pirate variety, I voted for Barnabas. Anyone who can get along with “prickly” people such as St Paul gets my vote, because I’m kinda prickly myself. My father-in-law, who served as a medic in the Navy during WWII, died this past week. In honor of that sailor and my father and two uncles who also served in the Navy, my vote goes to Erasmus/Elmo. Condolences to you and yours. May your father-in-law rest in peace and rise in glory! Beautiful reason for your vote. Agree with Philippa’s condolences. Will keep your family in prayer. I shudder to think that Saintly Kitsch might involve removable bowels. My mother’s name is Elmo so, on my bracket, I have Saint Elmo winning the Golden Halo. Go, Elmo, go!!! As someone with celiac disease, I had to vote for Elmo. I knew he was patron of sailors, but I did not know about him being patron of those suffering from intestinal maladies. I’ll have to post that on my FB celiac group. I didn’t know that those of us with CD had a patron saint, so I’ll join you. However, I had to vote for Barnabas on general principles. I agree with those who have pointed to Barnabus’ graciousness and kindness! Plus I love purple. Barnabas for me today. Besides being a wonderful Christian example, he is also known as the Encourager or Son of Encouragement. His intercession is sorely needed in these days. I was also ordained deacon on the day following his feast day. St B is June 11th. We always had a church picnic. Always a great childhood memory. Anybody who could put up with Paul deserves my vote. Especially when he eventually had to part company with him. Barnabas’ love for the gospel outweighed his poor choices in companionship. But he saw the light eventually! Elmo became patron saint of those with stomach maladies. It is a wonder they didn’t name Barnabas the patron saint of rope makers! Gee, went to St Barnabas growing up, will be @ friends funeral there this Saturday. Saw St Elmo’s fire on the wings of my airplane. Grand daughter’s fave video was Elmo tap dancing down a flight of stairs. To think Elmo is right there with Probiotics, which have saved my guts, wow. What a conundrum! Goin’ Elmo, but will say a special prayer for B @ St B.
I have alway loved Barnabas because his name means Son of Encouragement. He encouraged Paul when the others didn’t trust him. He encouraged John Mark when Paul was irritated with him. We all need encouragers. Thanks be to God for all the Sons and Daughters of Encouragement I’ve been privileged to know. In honor of diaconal ordination date, it’s Barnabas fir me — although the celebrity blogger presented a very cool hagiography of Elmo! Barnabas is my pick for the Golden Halo. He exemplifies those special followera who work behind the scenes to support and encourage. In spite of having Crohn’s Disease, I voted for Barnabas. Paul spoke of having a thorn in his side — it seems to me that he was the thorn in the sides of many others. Elmo was brave to halt his flight and return for what sounds like a two hour season premiere episode of “The Walking Dead.” His stomach-calming abilities come in handy for reading about all the torture and mayhem he endured. But then there’s generous, encouraging, welcoming, reconciling, and also brave Barnabas, and that puts out St. Elmo’s fire. Namesakes notwithstanding, it’s Barney for me. Antioch where Saul became Paul and Jesus followers were first called Christi-ans. Barnabas at the heart of both re-brandings. Personal inspiration. Barnabas: the Patron Saint of Associate Pastors! I had to go with Elmo, Patron Saint of the Alphabet and Potty Training, and apple of my daughter’s eye until the episode about giving up the binkie. Their relationship was never the same after that one. Another conundrum. I love them both but went for Barnabas in honor of Mitford Fr. Tim’s faithful dog among other reasons. Good one, Patsy! The Mitford connection! Of course! I had forgotten about Fr. Tim’s Barnabas. Now I’m really glad I voted for him. My heart goes out to Elmo for his extraordinary suffering… I am truly distressed by his story. However, personal suffering is not as difficult to bear as living and working with difficult people on an ongoing basis. Barnabus apparently is the personification of the saying “he had the patience of a saint”. Thanks for putting my reaction into words. Agree wholeheartedly, thank you. Paul may be one of the most influential writers and preachers of all time but oh, he must have been hard to work with. As I thought about the degrees of suffering, something I read on http://www.agapebiblestudy.com/ came to mind. I don’t think the Blessed Virgin’s suffering was less because it was not related to living and working with a difficult person. Nor would I say that The Blessed Virgin’s suffering was less because she was not crucified. How does one survive being drawn and quartered? The Brat Pack stands firmly behind Elmo. Barney vs. Elmo!? Frankly Barney always turned my stomach with his nonstop cheeriness, and Elmo is perhaps the most annoying of the muppets, so no guidance on my vote there. Like so many others mentioned, sailing runs in my family. My father was in the Coast Guard, my brother in the Navy and going back generations on my mother’s side one finds many sailors, including three great uncles who died on the Princess Sofia off the coast of Alaska just weeks before she was born. And as I suspect this will be my once chance to vote for Elmo, here goes! It’s isn’t Barney; it’s those impossible children. St Elmo. No contest. Anyone who could convert 10,000 after being tortured gets my vote. Besides, everyone has intestinal issues from time to time, good to know there is a Saint you can pray to while you are, ahem, sitting there dealing with it. Despite having the song “St. Elmo’s Fire (Man in Motion)” now stuck in my head for the rest of the day, I voted for Barnabas–anyone who could travel with the prickly Paul without losing his cool has a lot to teach me. I have always wondered who to blame for Army’s lack of success in the Army Navy football games these last several years. I guess we have suffered from sailors…. Poor Barnabas! Even though having written a rather objectionable letter himself, he did have to deal with Paul — definitely enough to try the patience of a saint! I will not reveal my Super Tuesday vote but Barney is purple… As for Elmo, his bio reads, in part: “He is the patron saint of those suffering from intestinal maladies and sailors.” With Elmo in mind, indeed, I have suffered from both tummy aches and my fun-loving and occasionally lovingly insufferable brother, USN-retired. As the mom of a Naval officer, I have to vote for the patron Saint of sailors- St. Elmo! Normally, I would go with Barnabus, but…I can’t. I just can’t vote for Barney. Barney is the most annoying dinosaur EVER. So, tickle me Elmo it is! I concur. Usually purple is my favorite color, but not on dinosaurs. Barns as for me today – gentle encourager of the early church. My hubby is a retired Navy Chief so there are times when I suffered from sailors! But I voted for Barnabas because the collect for him spoke to me today. I’ve had my share of sufferings from intestinal maladies, but sailors have never bothered me. As a person “suffering from (serious) intestinal maladies” the obvious choice for me was Elmo. I’m not “chuckling” about my gastrointestinal illnesses. I am disabled by them. I need a St. Elmo in my life. We both understand what it is like to suffer. To those of us with such maladies Paul Ambos’s idea of kitsch removable bowels is not so unattractive as it might seem at first blush. “He is the patron saint of those suffering from intestinal maladies and sailors.” I voted for all mobile cause I have been suffering from sailors for quite a while. I planned to vote for Barnabas for all the attributes many have mentioned – kindness, charity, and greater tolerance for prickly Paul than most. But seeing how he has it well in hand, I cast my vote for today’s underdog Elmo – the red furry version is one of my favorite Muppets and In the past I have had some minor intestinal issues so now I know to whom I should direct my petitions. The Barnabas collect really spoke to me and where I feel myself during these days of Lent. Love a kind man and a reconciler. We need that. Anyone that can get along with Paul gets my vote. I actually like the red furry guy better than the purple one, but Barnabas got my vote. I am on a losing streak. I voted for Elmo for several reasons. Barnabas is a wonderful Saint and has my admiration but Elmo’s martyrdom and his faith in the face of all the torture is amazing. I know I could not do that. Elmo’s fire is the deciding factor for me. Hmmm…. not to be disrespectful, but my first thoughts about Elmo were, “wasn’t tickling a part of the tortures he received? !” Yes, I am a fan of Sesame Street and bought a Tickle me Elmo doll for my daughter. What can I say? It is perhaps not surprising that the SEC is not alone in succumbing to the temptation to interchange St. Elmo with the little red furry monster. For a laugh, Google Saint Elmo’s Fire images. Anybody who had the patience and fortitude to stand being in the presence of Paul, let alone working with him as an equal, should have been made a saint on the spot. To have the disciples accept him as being worthy, Barnabas sold his goods and gave them the proceeds to use as they saw fit. Then he alone first welcomed Saul/Paul who was still highly suspect as a former persecutor of Jesus’s followers. Grace and compassion were indeed his trademark characteristics. Bloggers, you can do better than smarny Barney! Sweet little Elmo was OK. Blog on ! Because a dear friend of my daughter’s is in the hospital with stomach maladies this week, it is Elmo for me. May that saintly fire surround her and heal her. First, I have to say that the comments today have been truly wonderful–quite full of madness! Thanks to you all for the Lenten levity. This matchup was inspired! As much as I want to vote for the underdog (I know you hate that, DonnaD), and for Elmo’s fire, I can’t get past Barnabas’ having all the oxygen sucked out of the room by Paul. I never noticed that Barnabas was such a leader! He invited Paul to work with him, and Paul has gotten all the credit. So…. I am voting for Barnabas. I did enough voting for the underdog yesterday in the national election…. Yesterday’s national voting for the underdog is certainly a saintly thing and very worthy of commendation, Susan. had to vote for Barnabas. Oldest daughter (25 years old with a JD degree) still gets creeped out by the Elmo character on Sesame Stree. This is a difficult call; I voted for Barnabas, but now I know to pray to St. Elmo when I am plagued by sailors. I had to vote for Elmo. I have lately been struggling with the hypothetical “what would I do” if put in the position so many Christians in the mid-east are in, being challenged to recant their faith or be killed. St. Elmo did not waver. If only I were sure that I would follow his example. I would like to think so, but I wonder. Barney–for his compassion, kindness, people skills. Boy, do we need that today! And, also, I have not said this before in playing Lenten Madness, but purple is the color dear to my heart, not just for lent, or snail juice (see last year), or Lenten Madness products, but also for Kansas State University, beloved by my whole family. This is not the first day Lent Madness has fueled sibling rivalry in our household and it won’t be the last, but it’s bound to be one of the longest. It’s a snow day from school so I will be hearing “Barney!” “Elmo!” “Barney!”… All. Day. Long. Of course, arguing the merits of Saints of the Church is a refreshing alternative to their usual squabbles. May St. Barnabas encourage you! assistance! To add further weight in St Elmo’s favor, my Dad was a WWII Navy Medic as I read someone else’s relative was also. I had the outstanding good fortune to experience St Elmo’s fire about 30 years ago. It was an amazing awe-struck moment which left a memory so vivid that even now it feels like it just happened. I voted for Barnabas. A kindly soul. If it were a battle of the small red furry vs the large purple furry, I’d take red: that dinosaur is dreadful. But the real Barnabas is much in need as I fight a non-Christian anxiety over the future of this nation. Encouragement and consolation in our Saviour, please. I’m voting for Elmo in honor of our friend Steve who came through surgery with flying colors yesterday. There is no better way to honor Elmo! Had to go with the patron saint of sailors… first time in a sailboat I thought we were going to tip over! I was praying and Elmo answered my prayers as I did not get dumped into the ocean! (True story – all my experience was with power boats, which stay pretty level). Plus my daughter & son-in-law are in the Coast Guard. Keeping our Coast Guard & Navy safe is huge to me. Patron saint of intestinal maladies was tempting, although I will admit that I hope to avoid disembowelment. My vote went to grace and compassion, which seem to be sorely lacking in our time. I grew up several blocks away from a church dedicated to St. Barnabas, and as a mildly dyslexic kid I read the name wrong (“why did they name a church after Barabbas?”). He certainly gets my vote for his saintly achievements, for dealing graciously with St. Paul, and as a personal apology for not reading the sign outside his church more carefully. I vote for Barnabas for his generosity, unselfishness, and unwavering dedication to the Christian Way. I have admired him since first studying Acts as a child in Sunday School. As a musician, pastor, and chaplain, I have dealt with more than my share of prickly people. Even I am prickly sometimes. God bless those who are blessed with patience! I voted for Elmo because I have a rare intestinal disease, but also because I’ve been to Diocletian’s palace. I learned long ago that the name Barnabas means “son of encouragement”. I have always liked him and the role he played in the early church. While I do have intestinal problems, I can’t not vote for Barnabas. I always hesitate over the tales connected to the very early saints and martyrs. But I grew up on the shore of Lake Huron and my father sailed on a freighter on the Great Lakes. My mother worried about storms. I’ve always loved the stories of the disciples on the water. So today I have to vote for St. Elmo. Much as I believe in using legends to discover the person that inspired them, and much as Elmo has the most fabulous collection I can remember encountering in many years of Madness, the patient and, we may infer, self-effacing reality of Barnabas overwhelms the imagination. I wish whatever letters he sent during and after his collaboration with Paul had survived to be included in the canon. I had to vote for Elmo. He was an amazing evangelist who endured extreme torture and humiliation as he answered God’s call. Barnabas is a wonderful saint, but the kinds of extremes in the life of Elmo are uncommon. Not fair….. Of the childhood memories…. Elmo is way superior BUT for saints, Barnabas, the encourager, is a hero and wonderful so all votes had to go to dear St Barnabas. Encourage all. I had to vote for Elmo, because Barnabas, in my books was not as “sweet” as all that, since he seems to have been willing to side with the “James faction” when it came to eating with Gentiles. Jesus (and Paul) ate common meals with everybody. I think Barnabas was not brave enough in this regard. In this day of division we need the example of Barnabas who reached out to Paul, the questionable Christian, taking him into the ministry, andthe community, over the objections (and fears) of the rest of the disciples. America needs him in our spirits. Nestled in the shadow of Lookout Mtn. In Tennessee, is a neighborhood named St. Elmo. Both of my parents ( may they rest in peace) were born and raised there. So guess who got my vote! I always found Barney kind of creepy and Elmo cute but having dealt with difficult people and perhaps being one on occasion, I had to vote for Barnabas. Barnabas is really a nickname–Bar=son, Nabas=encouragement. Son of Encouragement. His real name was Joe from Cyprus. He is our patron saint at St. Barnabas Episcopal Church in Montgomery, Ohio, where we try to live into his legacy as a Community of Encouragement. It is amazing how misunderstandings seem to melt away when we are all striving to encourage others. On behalf all souls with ulcerative colitis and Crohn’s Disease, I had to vote for Elmo. Hopefully Elmo is also the patron of part time sailors as well. Gotta go with Elmo whose patron saint should have been the energizer bunny. Im also a weather geek, so the meteorological reference helped my choice as welk. I’m a sailor and I look like Deni Moore (with a curly bob.) St. Elmo it is! I’m sorry but if you are arrested and tortured….bound in iron chains, put into a pit filled with snakes and worms, sprayed with boiling oil, covered with sulfur and/or molten metal, thrown into a barrel studded with spikes and rolled off the top of a mountain, drawn and quartered by horses, and/or seated and baked in an oven AND miraculously survive then imprisoned but later freed by an angel…and after all thatpreach to and baptize 10,000 new Christiansthen get arrested AGAIN, enduring more torture and humiliation….you deserve a vote…a freakin’ vote people! Putting up with Paul for as long as he did (and insisting on a second chance for Mark) gets Barnabas my vote. Voted for Elmo as the patron saint of sailors being the daughter of one, the phenomenon of St. Elmo’s fire always fascinated me. Not to mention having a sweet 80s era song named for it. Not to mention surviving torture to just later be disemboweled is pretty intense. Agree with others who admired Barnabas’ ability to get along with “let women be silent” Paul. St. Elmo was truely awe inspiring, Surviving such tortures and creating spectacular lighting of sails. However, Barnabas inspires me to Christian action. Not splashy, but leading to a true baptism of the spirit, taking in one despised, feared by others, leading the way, then inviting another to join and eventually get more credit. Barney, like the fictional one named” Fife” Whistled an uplifting tune, worthy of a Halo. Haha! Barney Fife! Thanks, Lee! Elmo could have played it safe. He had escaped but chose to get back in and fight the good fight. You have another even match. I love Barnabas for his standing up in the church where it was needed. But I had never known Elmo, and I think if there were more up-to-date info, it would be no challenge. He stood up in spite of all it cost him and made a difference for so many. I admire his brave dedication to our Lord. I wonder if we can begin to correct mis-information about the Apostle Paul/Saul. That is the idea that his name was changed from Saul to Paul when he because a Christian. As a Hellenistic Jew he had a Hebrew name, Saul, and a Greek name, Paul. After his conversion, according to Acts, when he was with Jewish Christians, especially in Judea, he was still address as Saul. When with Greek speaking Christians, and all his letters were to Greeks speakers, he was Paul. Saul and Paul in their English transliterations do look and sound alike. Shaul and Paulus, not so much. After all, Hebrew Christians continued to call Peter Cephas, only Greek speakers called him Peter. The Paul/Saul think probably springs from that built in heresy that hold Christianity has supplanted Judaism. It could also come from the Biblical trope of people getting new names as a signifier: Abram/Sarai to Abraham/Sarah; Jacob to Israel; Simon to Peter. I can see why Barnabas is way ahead in the polls. Anybody who could put up with Paul on long trips has GOT to be a major saint. And anybody about whom there are six different “traditions” (i.e., myths) about their death is a little suspect. I’m a sailor & have stomach issues so I went with my gut and voted for Elmo. BUT if I had a second vote it would go to Barnabas – as mentioned if he could put up with the prickly one he deserves the vote. Years ago I did one of those Myers-Briggs tests that used Biblical characters. You were supposed to get three results and sort of combine them. I got three Barnabas results. I had to go with him. Tough choice today. My father, husband, uncle and cousin are all Navy men, and one can always use some saintly help with intestinal problems. However, in the end, I had to agree about St. Barnabas putting up with Paul, so voted for him today. Wish I could vote for both, but I bow to the wisdom of the SEC. I love you, You love me, that’s why we’re a family, I think that is how Barny’s song went. Barnabas It would be like not voting for an old friend. Still it is very hard not to vote for someone like Elmo. Thanks be to God for both of them. and gave us so much. Thank you, Tom, for sticking up for the Apostle Paul. I think you’re the first one so far today. I believe you did this just so you cold have that graphic. It’s fascinating to read everyone’s reasons for their choices!! I was impressed with Elmo’s fervor and stick-to-it-tiveness. (sorry, senior ephasia is very annoying!) But Barnabas impresses me – to have the faith to believe in Saul’s conversion and then to have ‘put up with’ Saul/Paul, to have shared ministry and actually let him take the credit, and then to continue on in the background – these are commendable values. Oliver, I agree that Barnabas did a great did, and truly anyone who could put up with Paul for a year must truly be a saint. But I voted for Elmo because of his suffering. Besides, I’m a water baby and sailor and I like knowing he is out there with us. That’s supposed to be”deed”. Darn auto-correct! Why is it called “auto-correct,” anyway? I voted for Elmo in honor of my father because he is the patron saint of sailors. I was all set to vote for Barnabas for his support of and patience with Saul as well as being selfless and supportive, until I read the collect for Elmo: “Make us lights of your great love to those who are lost.” Perhaps a bit of a stretch, but it sold me. I hadn’t heard anyone else mention the Barnabas=Zeus/Paul=Hermes connection before. However in seminary, I wrote an exegesis on that Acts passage about Barnabas being the leader & Paul being the wind-bag. Anybody who could put up with St. Paul gets my vote. St. Paul, with God’s help, did many wonderful things for the early church, but every time I read I Corinthians I have to remember that God can use anyone, no matter how conceited sounding and prickly to advance His kingdom. I voted for elmo Because he fought through really hard times, Like being tortured and arrested. How could I NOT vote for that great missionary St. Barnabas, the Son of Encouragement, whose feast day is on my birthday? I strive to emulate him in my life. I’ve got to add that I’m a bit baffled by all the Paul-bashing going on here. St. Paul had quite a few travelling companions, friends, co-workers, people he mentored, etc. over the course of his ministry. It’s not as if Barnabas, in his great patience, was the only one who could tolerate Paul for as much as a whole year. Sheesh. cargo movement – we water guys have to stick together! I voted for Barnabas because his kindness certainly had to be tested traveling with Paul. My vote went to Elmo today, mainly because my 4 & 6 year old grandsons like him. I have an adorable photo of my oldest grandson when he was 2 sitting in his Elmo pajamas and Elmo hat reading to his stuffed Elmo. Priceless! Barnabas is such an exemplar of the kind of saint we need today that I never doubted I would vote for him–a rare certainty in a saintly smackdown! Without his perseverance, there might have been no Paul and no Christianity in our time. Barnabas gets my vote for his generosity and kindness and faithful preaching of the Gospel. St. Elmo’s story is full of fascinating legend but I fear it is no more than that. I like saints whose holy lives are either documented or at least plausible. With all that’s going on here during this election year, I’m voting for grace and compassion. 10,000 baptized by Elmo…that IS following Christ’s command. I’m for Barney. We need more people who can deal with the notoriously prickly among us. Positively. Hopefully. Willing to take a risk on others. Gracious and generous. Ditto Donna K above. I watched Sesame Street, but that purple dinosaur makes me break out in hives. I couldn’t possibly vote for him. On that basis alone, I voted for Elmo. Elmo. How committed can you be to almost give your life twice to Jesus. Under torture. And, as a professional sailor, I was served well by my patrons saints in some ferocious storms. And, I loved Sesame Street as a dad of four boys. A show we could all watch! Elmo. Both suffered for the cause of Christ. It seems Barnabas did not get the recognition he deserved in the New Testament. We only have Paul’s letters, at least he gets credit for them all. Have always been curious about this man in the shadows of the NT. So I vote for him. Gotta vote for the Encourager! May we have many, many more who follow his example. 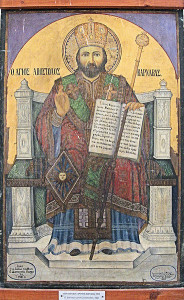 A Cypriot I know told me St Barnabas was the first bishop of Cyprus and also attended the first Council of Nicea. Same Barnabas? Does anyone know? Yes and no. This same Barnabas is traditionally recognized as the first archbishop of the Orthodox Church of Cyprus. However, he attended the Council of Jerusalem, not the Council of Nicaea. Barnabas died around the year 61; the First Council of Nicaea was held in the year 325. I wear A St. Elmo necklace everyday. Loving people with celiac, ulcerative colitis, seeing that colon removal is on the horizon and eventually a liver transplant, I pray to St. Elmo everyday for intercession. And please everyone consider organ donation and let your families, your doctor, your hospital know your wishes. I join my prayers to yours for Elmo’s intercession. I voted for Barnabas because anyone who could travel and live with Paul deserves a saintly crown. Because Paul could be such a pill! By now Barney is the obvious winner, but for me it’s the patron of sailors. When I first saw Elmo listed as a saint, I smiled. My husband has always suspected Barney might secretly become a cult leader, calling on his minions with a cheerful “hi kids!” In true madness fashion, this reasoning gets my vote for Elmo! I think I also saw St. Elmo’s fire out an airplane window once upon a time. I voted for Elmo–fortitude under torture and St. Elmo’s fire did it for me. I love Barnabas, too. As usual. But more seriously… I am voting for Barnabas partly in honor of my Uncle Keith, who told me that in his time as a Methodist minister, he was inspired by Barnabas to encourage his people, and encouraged them to encourage each other, too. I was just thinking that in “Blondie,” Elmo is the little kid who interacts with Dagwood and often has a refreshingly odd-ball take on events. But then, in Lenter Madness, we never ever vote for someone who probably never existed — uh, most of the time anyway…. Barnabas. Grace, compassion, encourager of the early church and his work/mission at Antioch. Also purple. In honor of St. Barnabas Episcopal Church in Portland, OR. Yay Elmo…you have my vote!! I decided since there had been so many one-sided outcomes in the Round of 32 that I would go back and write in the percentages on my bracket for future reference. And although I, too, was disappointed that Katerri Tekakwitha lost the year’s closest race so far to Columba, I very much doubt that the final score was 51% to 51%! Adam may want to take another look at that entry. Sorry – I’m on the wrong day. I’ll re-enter this comment on the current contest. Four of my children were Baptized in St. Barnabas’ Church (N.H.). Could not vote because of a computer glitch.